A petition to change the name of one of Overwatch’s upcoming Halloween skins has racked up thousands of signatures in less than half a day. The campaign focuses on hero Doomfist’s spooky new legendary skin, which will launch as part of this year’s Overwatch Halloween Terror event. Doomfists’ skin for this year’s event casts Overwatch’s punchiest hero as a more aquatic threat. His new look offers fins, gills, and scales, with the pauldron on his right shoulder gaining something of a crustacean-style vibe. The new skin is currently called Swamp Monster, but Overwatch fans feel there’s the potential for more effective wordplay. 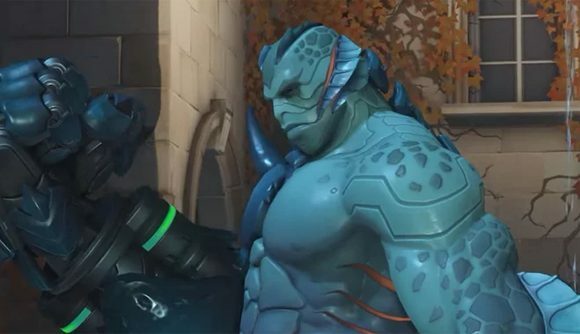 The petition, which was posted to Change.org and began last night, is titled “Could Doomfist’s fantastic new Swamp Monster Halloween skin be named DOOMFISH instead?” At time of writing, it’s approaching 3,000 signatures, and is top of the Overwatch subreddit with over 18,000 upvotes. Amusingly, the petition is also addressed to “Overwatch Overlord Jeff from the Overwatch team” – Overwatch lead designer Jeff Kaplan to you and me. Overwatch Halloween Terror 2018 begins on October 9, and will run for the rest of the month, coming to an end on October 31. You can check out the Doomfist skin in question in the tweet above – clearly somebody at Blizzard enjoyed Guillermo Del Toro’s The Shape of Water earlier this year.